Substance - Rise And Shine. Vinyl EP. Bleep. Peter Kuschnereit, also known as Substance or DJ Pete, has long been known to heads as an essential figure in Berlin dance music, though he has comfortably flown under the international radar. Born and raised in the central district of Kreuzberg (where he still lives in the same high-rise he grew up in), this year marks the 30th anniversary of his DJ career – and a fitting moment to announce his first solo EP on Ostgut Ton following contributions to previous compilations Fünf and Zehn and his longstanding relationship to Berghain. Locally, his influence has been multifaceted: an employee at the famed Hard Wax record store for some 27 years, Kuschnereit is also one of the core DJs in the legendary Wax Treament party series, helping to unite diverse strains of global dance music – from dubstep, grime, house and techno to Senegalese polyrhythms – all pumping through the KILLASAN sound system. 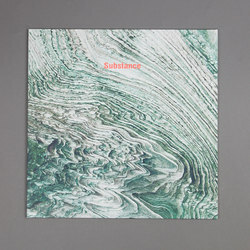 Indeed, eclecticism has become a kind of trademark for Kuschnereit as evidenced on various mid- 90s and 2000s deep techno classics with Vainqueur on Chain Reaction and Scion Versions, a funky Latin techno 12” as DJ Pete on Surgeon’s Counterbalance, recent live collaborations with Sleeparchive as TR-101 and dozens of his online Wax Treatment podcasts. Rise And Shine sees Kuschnereit fusing his deep, industrial aesthetic as Substance with the resonant bass-heavy leanings of DJ Pete, as evidenced on the title track’s off-kilter metallic riddims and multiple, interlaced SH-101 and Prophet 5 melodies. From there, potential set-closer “Countdown” blasts off with relentlessly rattling, scraping breaks, hissing German vox and big chords. The compact explorations of “Bird Cave” and “Distance” offer a more atmospheric take on bass and rhythm, while EP closer “Cruising” re-explores the uncanny, Berlin deep techno cosmos Kuschnereit has helped define, this time in denser form.